Mark your calendars now for the first Wednesday of August. I don’t care in what year you are reading this, it still works. Heck, it’s been working for over 100 years. So I don’t see it stopping any time soon. This “museum” is only “open” (in this fashion) once per year and was the inspiration for my 2010 full day off from work CTMQ Adventure of the year. 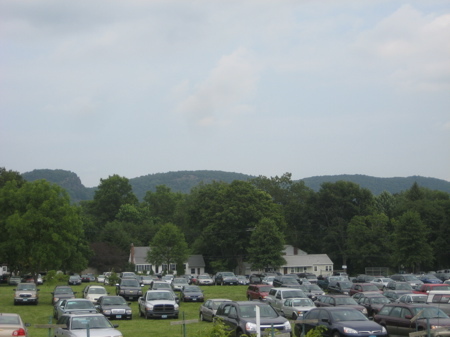 I built my central/southern Connecticut day around this place – and I’m glad I did. 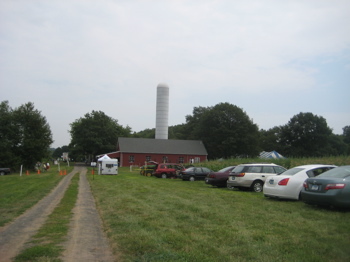 Lockwood Farm is not, of course, a “museum” in the traditional sense, but on its once per year Open House Day, it more or less becomes one. And that, my friends, is why you’re reading this. And why you should be opening up your Google Calendars now and marking off the date. Okay, maybe this place isn’t for everyone, and I get that. 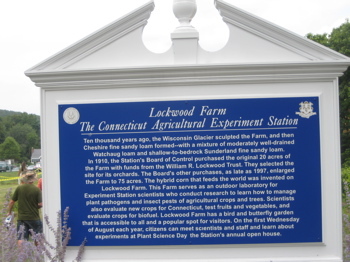 But it’s cool and it’s all part of the Connecticut Agricultural Experiment Station which is quite interesting in its own right. In fact, CAES makes more than one appearance on CTMQ. The original headquarters, a brick building in New Haven, is one of our 60+ National Historic Landmarks. Yes, I’ve checked it out. As cool as that is, there’s more. 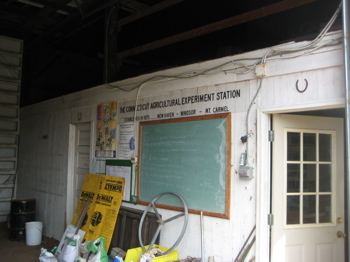 OUR Agricultural Experiment station was the very first one in the country! You guessed it – that warrants a wholly separate page on this website for some reason. 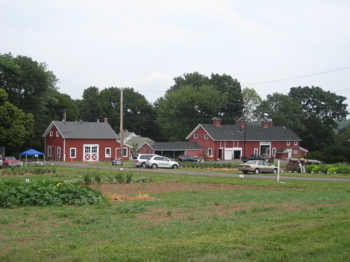 The Connecticut Agricultural Experiment Station is a state government component that engages in scientific research and public outreach in agriculture and related fields. It is the oldest state experiment station in the United States, having been founded in 1875. Its official mission is to “develop, advance, and disseminate scientific knowledge, improve agricultural productivity and environmental quality, protect plants, and enhance human health and well-being through research for the benefit of Connecticut residents and the nation.” The station operates a main research campus in New Haven, a research farm in Hamden, a satellite research facility and farm in Windsor, and a research farm in Griswold. These next few paragraphs come from the state’s own CAES website. As if you couldn’t tell. The bequest included 56 acres of land with buildings in South Norwalk near the Darien town line. The property was sold in 1900, and the Lockwood Trust was created to carry out the terms of his will. 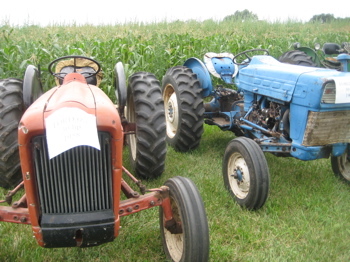 Some of the proceeds were used to purchase the land for what is now Lockwood Farm in Mt. Carmel, Hamden. Fun fact: Mt. Carmel is the real name of the Sleeping Giant. I’m mad at myself for not getting a picture of that plaque. At Lockwood Farm James G. Horsfall field-tested organic fungicides that he developed to replace heavy metals previously used to control plant diseases. 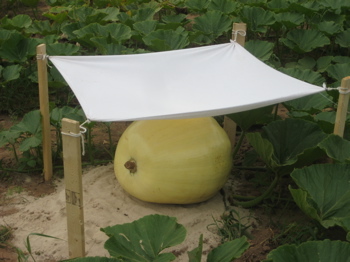 The principles of plastic plant shelters, mulches, and hot caps were worked out in the field in the 1950’s. 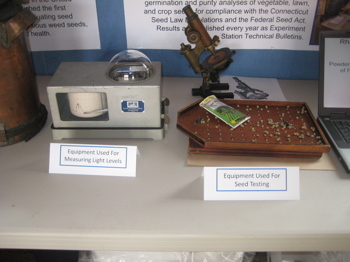 Since this time the Experiment Station has produced vast amounts of new information related to agriculture. In 1931 the farm manager began making systematic daily weather observations which help in analysis of experiments and provide information used to study climate. Today, the current Research Farm Manager continues to take daily weather observations. I arrived at the farm and was happy to see so many other visitors. I have no idea if the open house is as comprehensive on non-100 year anniversary years, but I’m sure it’s always impressive. I ended up spending much longer here than my day’s itinerary had planned for. And that, in my world, is usually considered a very good thing. As I got my bearings, I set about to learn a bit more about the farm itself. Aside from the corn and other stuff mentioned already, Vitamin A was first discovered in whole milk here! During the late 1970’s and early 80’s, Station scientists documented the presence of Rocky Mountain Spotted Fever and Human Babesiosis! During the 1990’s, Station scientists determined the cause of lead contaminants in maple syrup and found corrective measures. In 2002, Station scientists showed that arsenic leaches into the soil from CCA pressure treated wood. This research was instrumental in the withdrawal of CCA pressure treated wood from the consumer market. (What’s CCA? 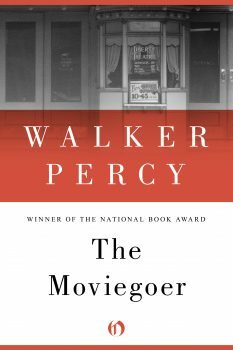 It’s this.). This is all just the tip of the iceberg. Today, they are researching why salt marshes and honeybees are disappearing. Of course they deal with Lyme disease and West Nile and Eastern Equine Encephalitis. More exciting, they were involved with that whole melamine thing in imported Chinese food products. There were tons of stations with educational displays. Almost too many, really. 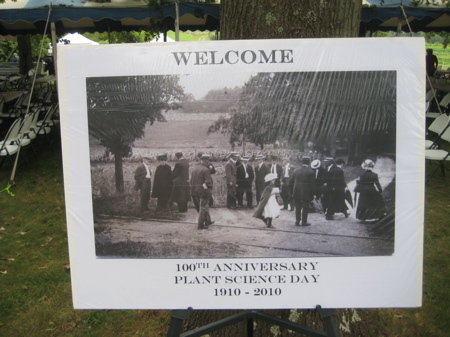 Not only that, there were several in-depth exhibits in the barn focusing on the 100 years of service ranging from “Vegetable Research: Then and Now” to “100 Years of Plant Genetics.” The vegetable one was pretty neat – 100 years ago on the first Open House field day, there were only two – TWO! 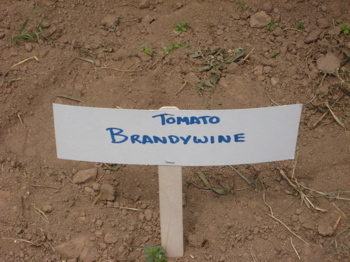 – vegetable crops growing in plots at the farm. 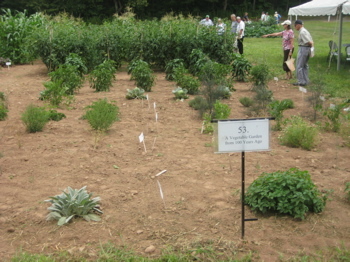 Today, there are tons, including 20 ethnic/foreign varieties not normally grown in Connecticut. 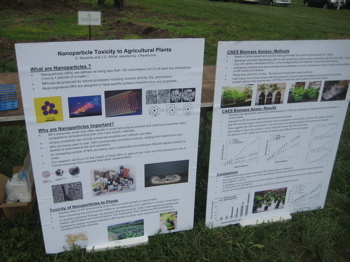 All around the farm, various stations were set up to visit, each exploring different areas of agricultural or related research. Most seemed to focus on parasites and invasive species and various blights and fungi that are hurting our crops and native plants and trees. The current arch-nemesis, the Emerald Ash borer, was all over the place – [and this was in 2010, before they] made their way to the state. On and on, all the way up to 90: Hybrid elm trees. 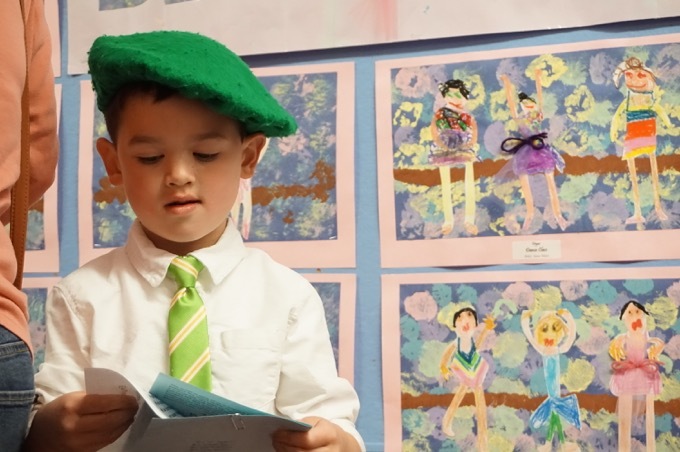 One station (or stations) of note was all about growing wine grapes in Connecticut. 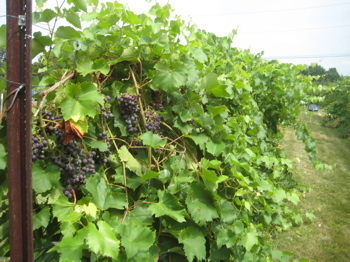 If you go to any of our wineries (I go to them all, here) and talk to the folks there who actually plant the vines and tend to them, you’ll learn that a lot of the hybridization that was required to grow viable grapes in Connecticut was done through a UConn/CAES partnership. These things don’t happen by accident. Another station of note (to me) was all about chestnuts. 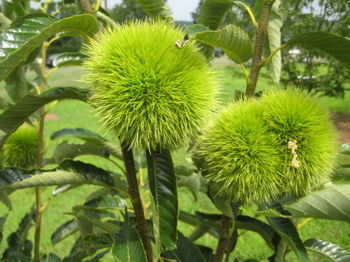 As we all know, American chestnuts were destroyed by a chestnut blight and almost all were wiped out. 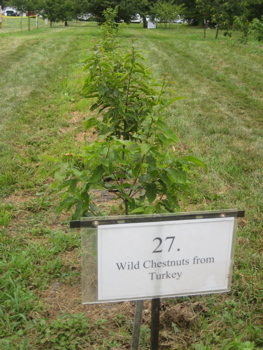 Since they are such an important and beautiful tree, plant scientists have been doing all sorts of things with Chinese chestnuts and Turkish chestnuts and cultivars from surviving old American chestnuts that are still scattered here and there. 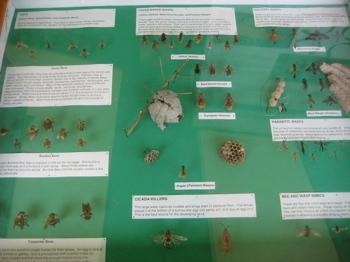 There was a lot of info about chestnuts. As one who has read this awesome book about the life and death and potential rebirth of the American chestnut, I was really enjoying myself. 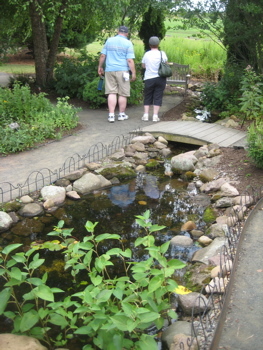 But not enough to miss out on the bird and butterfly garden! This offered a nice stroll through a sort of “closed” area that seemed much farther away from the crowd than it really was. I should also note that the whole event definitely had fun activities for the kids as well – scavenger hunts and a sort of passport program; it appeared pretty well done. As I strolled through the “100 year old” vegetable garden, highlighting heirloom veggies of yore, I reflected on how cool this stuff is when looked at in the light of today’s big agri-businesses and backyard gardeners. The success of both rely on the often thankless hard science down at places like Lockwood Farm. That is really interesting. I’ve seen that white silo countless times from the Sleeping Giant, now I’ll have so many fun facts to share next time I’m on a hike with some friends. Thanks again for the great site.